To play “To the Colors” on guitar, you use major arpeggio patterns #1 and #2. “To the Colors” is played to honor the nation, as in a salute to the “colors,” or flag. This tune is given the same respect in a military setting as the national anthem. 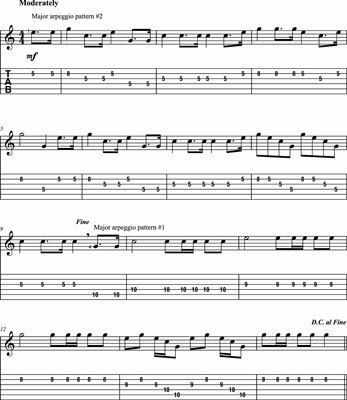 This piece contains a dotted eighth note followed by a sixteenth note, which gives the music a kind of buoyant feel. The comma at bar 9 tells you to take a slight pause before continuing. You can play the 5th-fret notes using a mini-barre (by flattening your 1st finger), but be sure not to make the notes too legato. Keeping a slightly detached feel between the notes helps to better emulate the sound of a bugle, which is the effect you’re going for. The last measure is marked D.C. al Fine, an abbreviation for da capo al fine. In Italian, capo (KOP-oh) means “head” (as in “at the front of”), and fine (FEE-nay) means “end.” So when you see D.C. al Fine in a piece, it means to go back to the beginning and play until you get to the end. In this case, the end of the song is marked in measure 9, where you see Fine. So the second time through, you play up to the comma in that measure and then stop without playing the fourth beat in the measure.